President David Granger yesterday thanked the members of the Guyana Defence Force (GDF) for their service to the nation on behalf of all Guyanese. 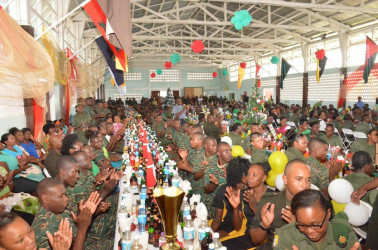 The President was at the time speaking at the GDF Headquarters, Base Camp Ayanganna, where officers and ranks were gathered for their Christmas lunch, a release from the Ministry of the Presidency said. 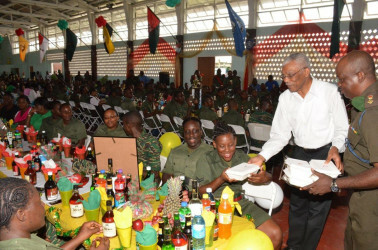 Referencing the role Venezuela played in the Rupununi Rebellion and the attempt at the occupation of the New River area by Suriname in 1969, the President lauded the role the GDF has played in protecting Guyana’s territorial integrity. He further noted that the army demonstrated its operational capability and ceremonial excellence with Operation Greenheart and their ceremonial displays during their recent 50th Anniversary celebrations. “Next year we will be celebrating our 50th Anniversary of Independence and I look forward to a higher level of performance by you the members of the GDF”, he said.